This is a mod that I’ve worked on using a combination of mods and tweaks that bring out the absolute best in this pedal. It includes a tweak to make a subtle fatter bass response to what is already a pretty good sounding pedal. A number of components are upgraded to higher fidelity parts that really make this a high tone pedal. Only minor changes are made to the clipping section to retain the transparency this pedal is well known for. 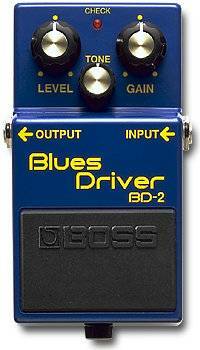 With this mod the BD-2 rivals the Ibanez TS808 Tubescreamer for top dog overdrive pedal. Comes with a bright blue LED and brand new 9 volt battery. Add $20.00 if you want the Fat option switchable.